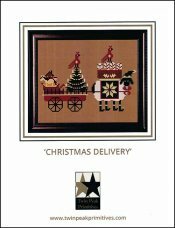 Christmas Delivery [C5212] - $13.00 : Yarn Tree, Your wholesale source for cross stitch supplies. Cross stitch pattern by Twin Peak Primitives. "Baahhh Baahh" a special Christmas delivery is on it's way! Dressed up as an elf, this sheep is ready to help Santa with his deliveries. Under elf surveillance is a wagon full of Christmas presents & a basket full of candy canes on his back. Stitch count is 99W x 68H. Stitched on #5357 Zweigart Aida 14ct. Rustico Oatmeal.